3-Way Skype Chat Deletion Methods on iPad, iOS 11 Supported! The advancements in technology has made it very easy for us stay in touch with our loved ones. Skype is one of the most famous applications which we use to send messages and video chat with others for personal and professional reasons. Moreover, now you can log in from the same Skype account across multiple devices and continue the same chat. For instance, when you are at home, you can use your Macbook or iPad and when you are travelling you can use your iPhone to send and receive Skype messages. While the application automatically synchronizes the messages across all the different devices, it is very important to be careful of your privacy. For instance - If you are planning a surprise for your wife and are discussing with your family members and friends from your iPhone when you are at office. The messages will be synchronised with the iPad that might be at home and your wife could involuntarily read the messages and it will no longer be a surprise. This makes it very important for you to delete Skype messages in iPad at regular intervals if not on a daily basis. Deleting the messages is also very important if you are selling the iPad to someone as you don’t want anyone to go through your personal messages. But how to delete Skype messages on iPad? Follow these steps if you want to delete a particular Skype conversation from your iPad. Open the Skype application on your iPad, you will now see all your contacts on the screen, touch the History button. Here, you will see your recent conversations with your contacts, look for the conversation that you want to delete and simply swipe the conversation to the right. Once you swipe, you will see a Delete button in red, touch the Delete button and that conversation will be deleted. Follow these steps if you want to delete your entire chat history of Skype. Open the Skype application on your iPad, search for the Tools button and tap on it. Now, tap on the Options button, in the Options menu you’ll find Privacy tab, tap on it. Here you’ll find Clear History button, tap on this button and all your messages, videos, voice messages, calls, etc. will be deleted. All the messages deleted via the 2 methods above can be recovered by recovery software. So, if you want to sell your iPad or give it to others, for privacy protection, you’d better erase them permanently, and iMyFone Umate Pro or iMyFone Umate Pro for Mac can be the perfect answer. iMyFone is trusted by thousands of users (every year) and reported by well-known media around the world. Let us have a look at how you can use Umate Pro to delete permanently Skype messages on iPad. Step 1. Download Umate Pro to your computer or laptop and launch the software, then, connect your iPad to your computer or laptop. Step 2. Now look for the Erase Private Data tab on the left side of the screen and click on it. Then, click on Scan button and the software will start scanning your device for all the private data. Step 3. Once the scanning finishes, you will see a list of all your private data in the iPad i.e. messages, photos, contacts, including the Skype messages. Simply select the Skype data from this list and click on Erase Now button. Step 4. As soon as you’ll click on the Erase Now button, a window will open that will ask you to type "delete" to confirm your choice. After typing "delete", click on Erase Now and the software will start deleting the Skype messages. It is important to ensure that you do not do anything on the phone when Umate Pro is deleting your Skype messages on iPad and also make sure that the iPad stays connected to the computer or laptop throughout the deleting process. Depending on how much data you have in your iPad, the deleting process can take several minutes. Apart from this, you can also use Umate Pro’s Erase Deleted Files option to ensure that your previously deleted data cannot be recovered in any way. Remember that the messages and conversations that you delete directly from your iPad can be recovered but when you use Umate Pro, the deleted messages cannot be recovered in any way. 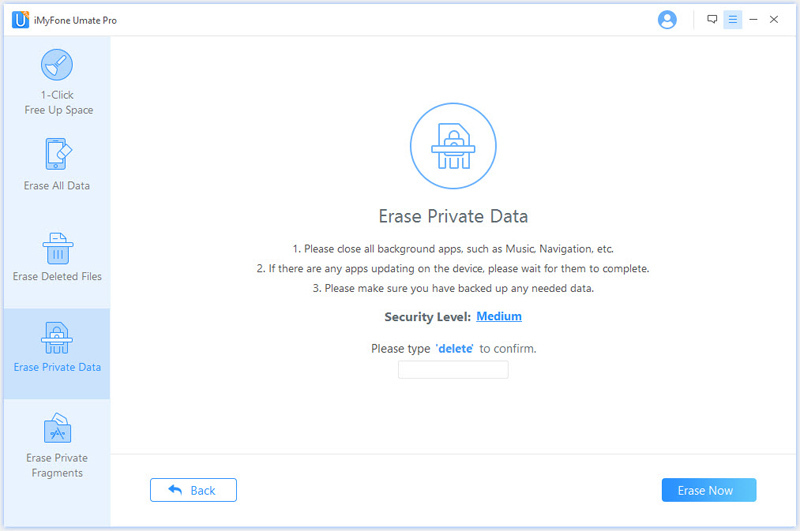 Now that you know how to delete Skype messages on iPad, start using Umate Pro to ensure complete privacy. The Erase All Data feature of Umate Pro is very useful if you want to delete data from your iPad or when you are selling it to someone. 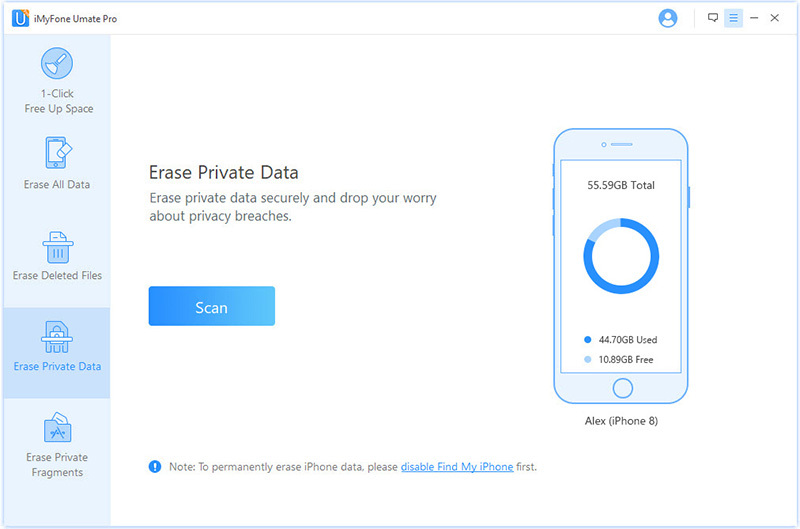 When you sell your device to someone, you certainly don’t want the buyer to go through your personal and professional data and using Erase All Data feature of Umate Pro allows you to delete everything from your iPad in the easiest way possible. Moreover, if you’ve been using your iPad for some time, you might have faced the low storage space problem for sure. 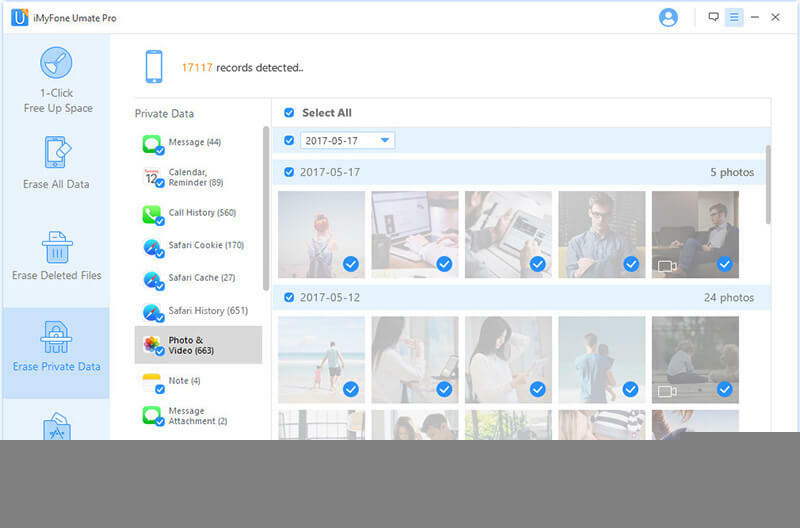 Umate Pro has a 1-click free up space feature which automatically deletes junk files, temporary files, compresses photos or creates their backup and even deletes the photos that you no longer need.